A zesty blend of red pepper and Parmesan cheese with a dash of light brown sugar and herbs. 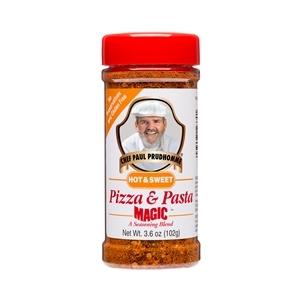 Chef Paul's versatile blend that adds excitement to soups, salads, egg dishes and your favorite pizza and pasta selections. No added salt. Contains no MSG or preservatives. Ingredient: Crushed red pepper. brown sugar, parmesan cheese (pasturized part-skim milk, cheese culture, salt, enzymes), garlic, paprika, onion, thyme, basil, oregano, tri-calcium phosphate (anti-caking agent).